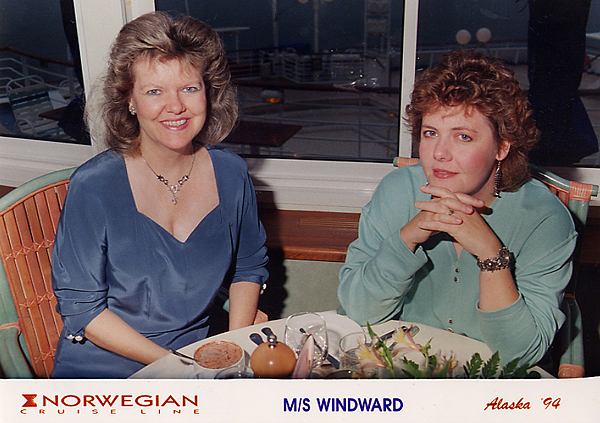 There’s lovely and photogenic Norma on the left and yours truly on the right, having dinner on the M/S Windward. I did several excursions off the boat (the helicopter landing on Mendenhall Glacier in my previous posting), a hike through the Tongass National Forest and a guided tour of the Totem Park in Sitka National Historical Park. Travel Archives: Yeah, that looks safe. Picture this. Alaska. 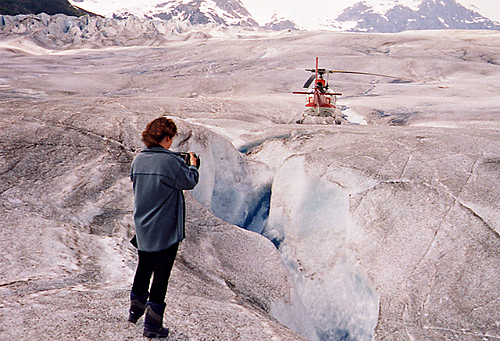 Mendenhall Glacier in Juneau. Circa 1990-something (as I recall). During a cruise with my friend Norma, we took this side trip excursion via helicopter. We were given groovy moon boots to wear, then turned loose on the glacier. I toted pounds of 35mm camera equipment and my brand new Sony videocam, which I’m using here. Back then, I apparently liked living (and shooting) on the edge (I know my dad will frown when he sees this shot—I sure am close to that precipice, aren’t I?). So this is why they made us sign that “withhold from harm” paper. Afterwards, I scooped water into my hands and drank straight from the glacier. Norma frowned and asked, “aren’t you worried you’ll get sick?” I figured if the water isn’t pure in Alaska on top of a glacier, we’re all doomed. And no, I didn’t get sick. Abbie & Todd, 9.12.2010 © Cindy Dyer. All rights reserved. Yesterday I photographed my friend Gina and her dogs, Lúc (left, shown howling at a passerby) and Gumbo (looking at me with his one good eye! 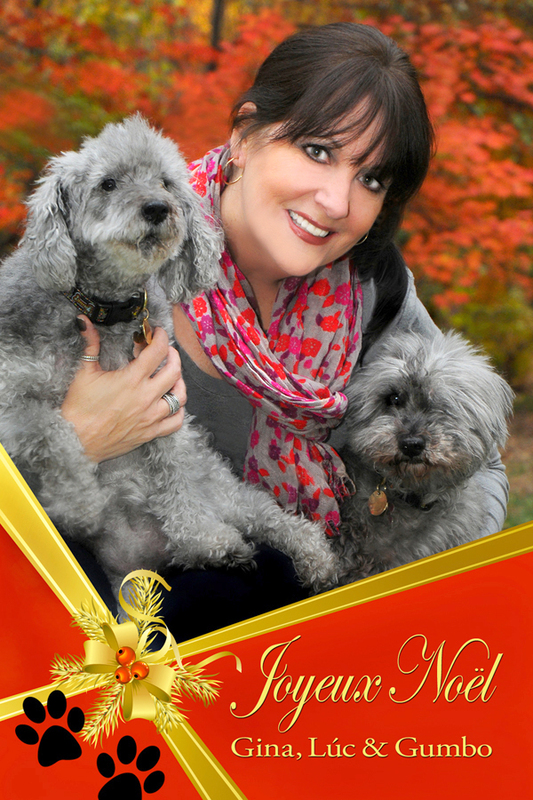 ), for her holiday card. Both animals were rescue/shelter dogs who had special needs—Gumbo had lost one eye to an infection and Lúc had to have a good number of his teeth extracted—but they have found a wonderful home with Gina. Add a holiday gift border, paw prints (both purchased for a buck each from http://www.vectorstock.com and manipulated/colorized to fit) and a greeting in French (she’s a Francophile and loves all things French), and voila—c’est manifique! Who needs Costco’s pre-printed holiday borders when you have me? Green Spring Gardens, 11.14.2010 © Cindy Dyer. All rights reserved. 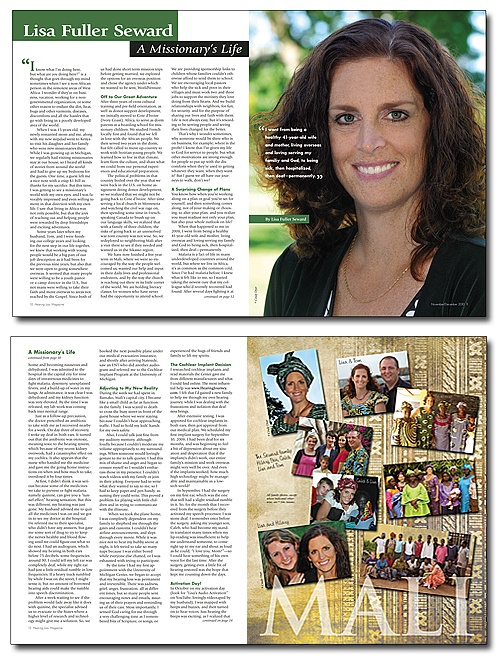 Lisa Fuller Seward is our cover profile for the November/December 2010 issue of Hearing Loss Magazine, which I design and produce bimonthly for the Hearing Loss Association of America (HLAA). 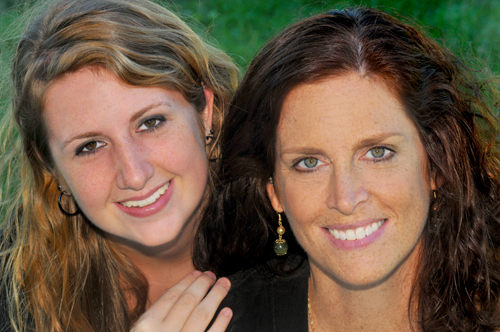 I met and photographed Lisa and her daughter Hilary for the magazine at HLAA’s convention in Milwaukee this past June. Lisa, husband Tom, and their three children (Hilary, a college freshman studying graphic design; Benjamin, a high school freshman; and Caleb, who just started fifth grade) are missionaries in Mali, West Africa. They are currently in Chicago for the 2010-11 school year, with the intention of returning to their missions work with World-Venture in Mali next summer. Lisa and Tom are currently helping with the youth program at their church, and Lisa is also a volunteer mentor in the “Mom to Mom” program. Their main responsibility this year on home assignment is to report to their donor base and build new support for the programs they are involved in overseas, including student sponsorships and women’s literacy. 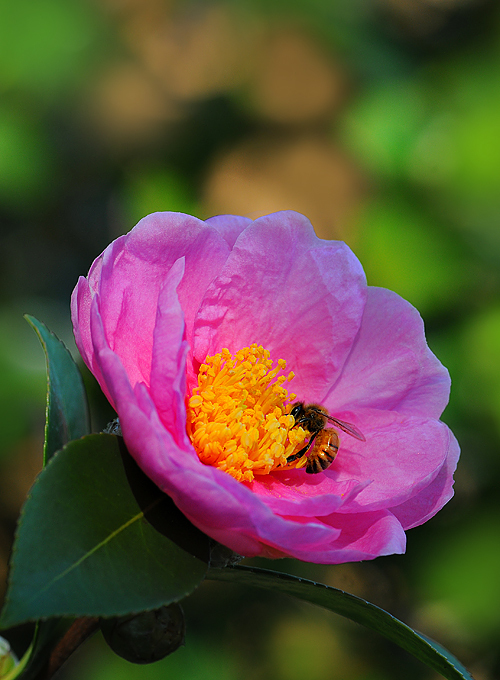 Regular updates and pictures are posted on their family blog at www.tomseward.com. Lisa plans to concentrate on language learning upon her return to Africa, working on the trade language to better communicate with nationals, particularly the women, many of whom have received very little education. She enjoys exchanging cooking styles and learning to live a rustic life, while sharing in the joys and sorrows of weddings, funerals, business ventures, and illnesses. 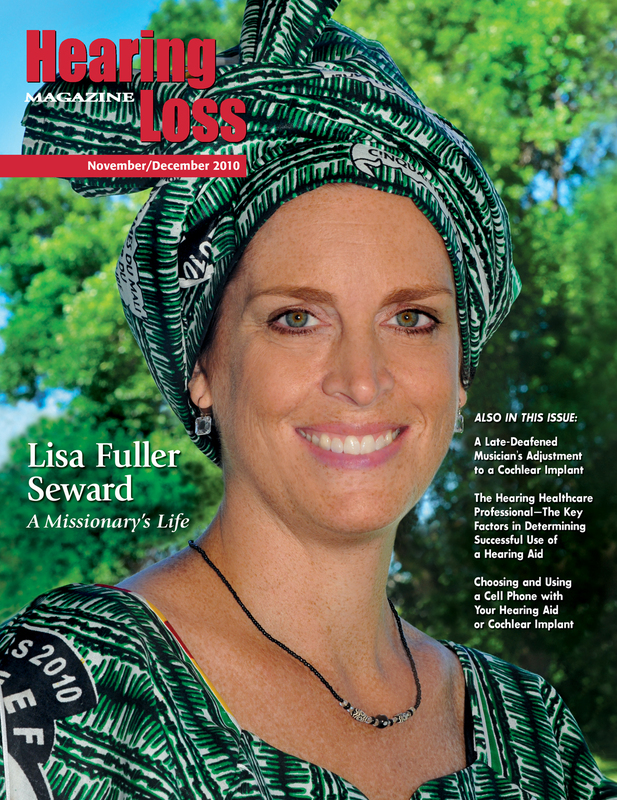 Since their return to Africa after Lisa’s illness and subsequent hearing loss and cochlear implantation, the Sewards have sensed an increased interest in their input by local friends who value their commitment to returning after such a difficult personal life event. The Sewards are eager to increase their impact in people’s lives as their sensitivity to people with disabilities has grown. Download Lisa’s article are her hearing loss journey in pdf format by clicking the link here: LisaFullerSeward. and Leslie Lesner, audiologist and owner of Lesner Hearing Center, in Alexandria, Virginia, for affording me the opportunity to photograph various hearing aids at her practice to illustrate Mark Ross’ article in this issue. A late-deafened musician tells how he adjusted to a cochlear implant. Want to learn more about the Hearing Loss Association of America? Check out their website at www.hearingloss.org.